The above info came from Cheyenne Diehl, and was edited by yours truly (contact me). The image came from Amazon.com. 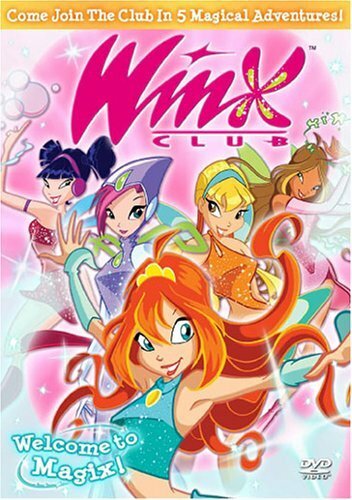 Notice: Winx Club is not Japanese animation! It is a cartoon created and produced in Italy. However, because it has a style that is strongly influenced by anime, I have decided to include it on this site. If you're one of those hard-core anime purists who can't stand seeing a non-anime series on a site dedicated to Japanese animation, then just press the Back button on your web browser and pretend like you were never here. Winx Club is about five fairies Tecna, Stella, Flora, Bloom, and Musa who go to school at Alfea. They have to deal with normal things like school, boys, friends oh yeah and keeping the realm of magix safe from the witches. Bloom possesses the ancient and most powerful of all magic, the Dragonfire. When the three witches Icy, Darcy, and Stormy steal it from her, they call up the army of decay, an immensely powerful army of all dead things from the past 10,000 years. The above description came from Elissa, and was edited by yours truly (contact me). Bloom dreams of another realm of magical beings. But that all became a realty when she meet a real fairy named Stella. Bloom found her magic powers and is now going to a school in the land called Magix. The school I'm talking about is called Alfea for fairies. There are two other magic schools which house two other magic types. One of them is called Red Fountain which houses hero's in training. The other is Cloud Tower which houses witches. Bloom meets the other fairy friends, Musa, Tecna, and Flora. The above description came from Alex Holley, and was edited by yours truly (contact me). A bunch of teenage girls have fairy powers and they battle the evil witches Icy, Darcy, and Stormy. Bloom has the Dragonfire and the witches are after it to become more powerful. Eventually, Bloom beats the witches and they get sent to a good boot camp where they're supposed to become good. Lord Darkar, an evil guy who got swallowed up by the Shadowfire, breaks them out and gives them gloomix. It's power jewelry that makes them more powerful. Now the witches have a better chance of ruling the universe, while destroying the fairies and the tiny pixies. The above description came from Sierra, and was edited by yours truly (contact me).